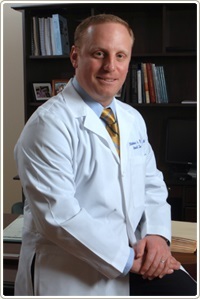 Dr. Fiore is board certified by the American Board of Surgery in both surgery and hand surgery. He initially developed his interest in hand surgery after fracturing his wrist, wrestling for the Duke University Blue Devils. Forced to undergo surgery and placed in a cast for several weeks, he truly recognized the profound impact having a hand injury can have on a person’s physical, emotional, and financial well being. After obtaining his medical degree from Ross University School of Medicine he entered general surgery residency at the University of Medicine and Dentistry-NJ Medical School where he achieved both local and national recognition in his ability to teach (see curriculum vitae). This teaching ability translated well with his doctor/patient relationships as most patients found him able to break down a complex condition and make it more understandable. Graduating from residency, he proceeded to acquire additional training in hand and microsurgery from the Baylor College of Medicine accredited fellowship where he performed well over 500 operations. The training was diverse to say the least and included elective, non emergent hand surgery as well as limb threatening or mangling trauma. Upon graduation he was invited to stay as faculty for which he was hired as an Assistant Professor in the Division of Plastic Surgery. It was a productive year clinically (performed about 400 procedures) as well as academically as he literally wrote the chapter’ on hand surgery which he co-authored in Sabiston’s Textbook of Surgery 18th edition. In addition, to his busy clinical practice, Dr. Fiore is a speaker for Auxilium Pharmaceuticals and a medical technology consultant. Dr. Fiore was also featured on a Christi Myers ABC 13 segment regarding the use of leeches on micro-surgical patients in October of 2006. Having the dream of being in private practice, he proceeded to form Fiore Hand & Wrist and ‘hung his shingle’ in November 2007. Dr. Fiore specializes in the diagnosis and treatment of Hand, Wrist and Elbow ailments. He is board certified by the American Board of Surgery and fellowship trained in hand and microsurgery. For more information on treatment options, or to schedule a consultation, call Fiore Hand and Wrist at (281) 970-8002. We are conveniently located within driving distance of Cypress TX, Katy TX, Spring TX, Tomball TX, The Woodlands TX, and Houston TX. For more information please visit Handcare.org. Please complete the following fields and click Submit. © 2018. Fiore Hand & Wrist All Rights Reserved.